Thank you for the compliment, Taylor! It took a lot of trial-and-error for me to figure out what worked for me. As a former tanning addict, I suffered from hyper-pigmentation (dark spots). As a lifelong picker, I am constantly battling red marks and scars. And as a 30-something, I am panicked about fine lines. If you’re acne-prone, consider adding Benzoyl Peroxide and Salicylic Acid to your regimen. 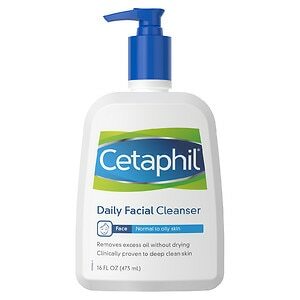 Cetaphil Gentle Skin Cleanser with Clarisonic. You can score a Clarisonic for 20% during Sephora’s 5 Days of 20% Savings for VIB Rouge and VIB (November 6-10)! Facial oil works well for hydrating the eye area as well. Often, I will use oil, let it to absorb, then apply cream. SPF or a primer with SPF – Laura Mercier Foundation Primer with 30 SPF is a great choice and can be purchased at Sephora. Retinol product- I recently switched from Retin-A .1% to Adapalene Gel .3%, both of which require a prescription. RoC Retinol Correxion Deep Wrinkle Night Cream is an effective and affordable OTC retinol. Facial oil works well for hydrating the eye area as well. Often I will use oil, let it to absorb, then apply cream. Benzaclin, which is a prescription and I apply only during breakouts. It contains Clindamycin and Benzoyl Peroxide. A comparable OTC product is Clean & Clear Persa-Gel 10, Maximum Strength . Neova Intensive Copper Peptide Repair Cream for when I can’t help myself and pick at blemishes. I also use this after professional laser treatments. The event runs November 6-10th. I am attending the First Access VIB Rouge Holiday Party tonight. Tomorrow, I will post of list to things to stock up on during the event!